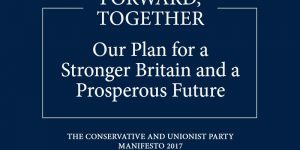 Prosperity And Security In A Digital Age is part of the Conservative Parties 2017 General Election Manifesto. The opportunities and threats arising from the advance of digital technology pose significant practical and philosophical challenges to people, communities and governments around the world. These new technologies provide us with new and faster ways to communicate, learn, travel, have fun and do business. They accelerate the pace of change – ushering in new norms in the space of years rather than decades; challenging our laws and regulations to keep pace. The UK has always been at the forefront of such changes, from the earliest days of computing to the development of the World Wide Web. Today, we continue that tradition with our world-leading digital economy, boasting particular expertise in artificial intelligence, cyber security, gaming, FinTech, GovTech, and virtual reality. We are optimistic about the opportunities on offer in the digital age, but we understand these opportunities come with new challenges and threats – to our security, privacy, emotional wellbeing, mental health and the safety of our children. A Conservative government will respond to these challenges, to assure the British people of security and fairness in the new digital age, and to strengthen the UK’s position as one of the world’s leading digital economies. For hundreds of years, the United Kingdom has determined the rules and formed the environment where new ideas and new technologies prosper – from financial markets to the steam train to human embryology and the code of life itself. Our wealth and security as a nation is founded on our ability to shape the future not just for ourselves but for the world. Now we must do it again, to create the rules-based framework in which the new technologies can create prosperity and growth. A Conservative government will develop a digital charter, working with industry and charities to establish a new framework that balances freedom with protection for users, and offers opportunities alongside obligations for businesses and platforms. 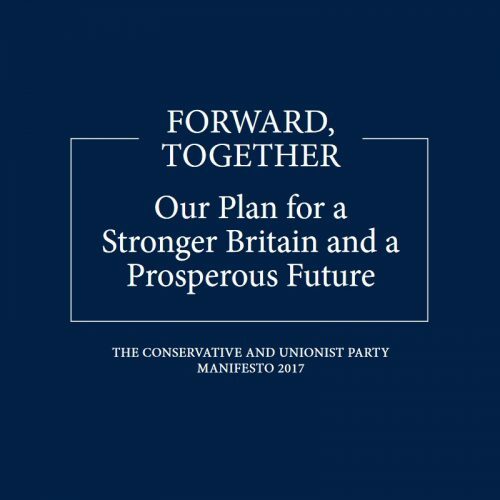 This charter has two fundamental aims: that we will make Britain the best place to start and run a digital business; and that we will make Britain the safest place in the world to be online. Britain’s future prosperity will be built on our technical capability and creative flair. Through our modern industrial strategy and digital strategy, we will help digital companies at every stage of their growth. We will help innovators and startups, by encouraging early stage investment and considering further incentives under our world-leading Enterprise Investment Scheme and Seed Enterprise Investment Scheme. We will help digital businesses to scale up and grow, with an ambition for many more to list here in the UK, and open new offices of the British Business Bank in Birmingham, Bristol, Cambridge, Edinburgh, Manchester and Newport, specialising in the local sector. As we set out in chapter one, we will ensure digital businesses have access to the best talent from overseas to compete with anywhere in the world. This will be complemented by at least one new institute of technology in the UK, dedicated to world-leading digital skills and developed and run in partnership with the tech industry. When we leave the European Union, we will fund the British Business Bank with the repatriated funds from the European Investment Fund. Where we believe people need more protections to keep them safe, we will act to protect them. We will give people new rights to ensure they are in control of their own data, including the ability to require major social media platforms to delete information held about them at the age of 18, the ability to access and export personal data, and an expectation that personal data held should be stored in a secure way. To create a sound ethical framework for how data is used, we will institute an expert Data Use and Ethics Commission to advise regulators and parliament on the nature of data use and how best to prevent its abuse. The Commission will help us to develop the principles and rules that will give people confidence that their data is being handled properly. Alongside this commission, we will bring forward a new data protection law, fit for our new data age, to ensure the very best standards for the safe, flexible and dynamic use of data and enshrining our global leadership in the ethical and proportionate regulation of data. We will put the National Data Guardian for Health and Social Care on a statutory footing to ensure data security standards are properly enforced. We will continue with our £1.9 billion investment in cyber security and build on the successful establishment of the National Cyber Security Centre through our world-leading cyber security strategy. We will make sure that our public services, businesses, charities and individual users are protected from cyber risks. We will further strengthen cyber security standards for government and public services, requiring all public services to follow the most up to date cyber security techniques appropriate. At a time when the internet is changing the way people obtain their news, we also need to take steps to protect the reliability and objectivity of information that is essential to our democracy and a free and independent press. We will ensure content creators are appropriately rewarded for the content they make available online. We will be consistent in our approach to regulation of online and offline media. Given the comprehensive nature of the first stage of the Leveson Inquiry and given the lengthy investigations by the police and Crown Prosecution Service into alleged wrongdoing, we will not proceed with the second stage of the Leveson Inquiry into the culture, practices and ethics of the press. We will repeal Section 40 of the Crime and Courts Act 2014, which, if enacted, would force media organisations to become members of a flawed regulatory system or risk having to pay the legal costs of both sides in libel and privacy cases, even if they win. We will therefore create a new presumption of digital government services by default and an expectation that all government services are fully accessible online, with assisted digital support available for all public sector websites. We will publish far more information about public services online, including relevant information about local issues and public transport so that every person can find out up to date information about roadworks, planning applications and bus routes online, without the hassle and delay that currently exists. We will create new ‘schools maps’ to help parents choose the school that is right for their child, giving them key information about quality of teaching, attainment and the curriculum of local schools as they choose their school preferences to support their decisions. If we are to make full use of this opportunity, we must use common platforms across government and the wider public sector. That must start with the way we identify ourselves online, so that people have one single, common and safe way of verifying themselves to all parts of government. That is why we shall roll out Verify, so that people can identify themselves on all government online services by 2020, using their own secure data that is not held by government. We will also make this platform more widely available, so that people can safely verify their identify to access non-government services such as banking. We will set out a strategy to rationalise the use of personal data within government, reducing data duplication across all systems, so that we automatically comply with the ‘Once-Only’ principle in central government services by 2022 and wider public services by 2025. And we will use digital technology to release massive value from our land that currently is simply not realised, introducing greater specialisation in the property development industry and far greater transparency for buyers. To make this happen, we will combine the relevant parts of HM Land Registry, Ordnance Survey, the Valuation Office Agency, the Hydrographic Office and Geological Survey to create a comprehensive geospatial data body within government, the largest repository of open land data in the world. This new body will set the standards to digitise the planning process and help create the most comprehensive digital map of Britain to date. In doing so, it will support a vibrant and innovative digital economy, ranging from innovative tools to help people and developers build to virtual mapping of Britain for use in video games and virtual reality. Some people say that it is not for government to regulate when it comes to technology and the internet. We disagree. While we cannot create this framework alone, it is for government, not private companies, to protect the security of people and ensure the fairness of the rules by which people and businesses abide. Nor do we agree that the risks of such an approach outweigh the potential benefits. It is in the interests of stable markets that consumers are protected from abusive behaviour, that money is able to flow freely and securely, and that competition between businesses takes place on a level playing field. It is in no-one’s interest for the foundations of strong societies and stable democracies – the rule of law, privacy and security – to be undermined. These are questions with which every nation is grappling. The internet is a global network and it is only by concerted global action that we can make true progress. We believe that the United Kingdom can lead the world in providing answers. So we will open discussions with the leading tech companies and other like-minded democracies about the global rules of the digital economy, to develop an international legal framework that we have for so long benefited from in other areas like banking and trade. We recognise the complexity of this task and that this will be the beginning of a process, but it is a task which we believe is necessary and which we intend to lead.